Instrumental meteorological observations commenced in St. Petersburg in 1724 and then in Moscow in 1731. During the 18th and early 19th centuries, occasional measurements were taken in Astrakhan, Kazan, Yekaterinburg, Riga, and Solikamsk but there were no continuous observations until the second half of the 19th century. By 1890, there were over 500 meteorological stations in the Russian Empire. The conventional ground observation network peaked in the FSU in the 1980s when 14 000 stations were operating. Afterwards, the combination of growing financial pressure and political instability in such regions as the Caucasus and Central Asia eroded the network. Historical instrumental records are infinitely more reliable than non-instrumental observations but these data are not without limitations. Uncertainties arise from changes in instrumentation, observation methodologies, and schedules and changes in location of sites and their surroundings. Particularly strong bias is introduced by urbanization. Folland et al. (1990), Vinnikov et al. (1990), Groisman et al. (1991), and Nicholls et al. (1995) discuss these problems and compare homogenized datasets with uncorrected historical instrumental data. Figure 3.17 depicts composite time-series of temperature anomalies for regions of the FSU. Climatic variability during the 19th and 20th centuries prior to the 1990s is discussed by Borisenkov (1992). Fig. 3.17 Annual temperature anomalies for regions of the FSU expressed as deviations from the 1961-90 norm. 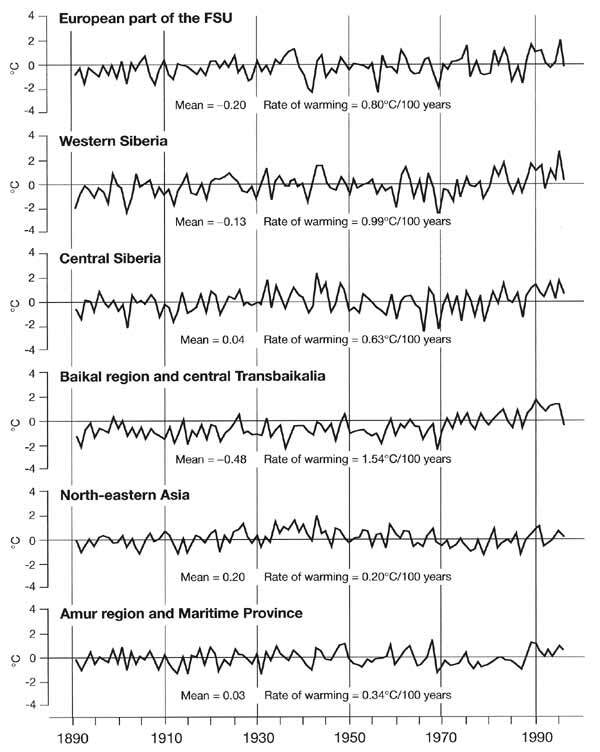 Although different regions exhibit quite different characteristics of temperature variability during the 20th century, the most striking feature typical of all Northern Eurasia is climatic warming at the end of the 20th century. This trend is produced mainly by the winter warming which is apparent not only in the European territory, Western and Central Siberia, where climate is controlled by the intensity of zonal flow, but also in the Baikal region and Transbaikalia which are dominated by the Siberian high in winter. Sahsamanoglou et al. (1991) have shown that not only has the surface temperature increased, but the whole of the lower troposphere (1000-500 hPa) has become warmer. Surface air pressure in the centre of the Siberian high varies and a continuous weakening of the high has been observed since the 1980s in step with the observed warming. While it is the Siberian high that controls local winter climate, could the current warming contribute to its weakening? In the western part of the region, the frequency of anticyclonic circulation has declined while the frequency and intensity of zonal flow has increased bringing about record-breaking warm winter weather (Klimenko, 1994a). The storm tracks have been extending further east too, bringing warmer weather to Western and Central Siberia (Rogers and Mosley-Thompson, 1995; Rogers, 1997). Constructing accurate time-series of precipitation is a challenging task especially if measurements of solid precipitation are involved. These are affected by blown snow and even small changes in exposure or instrumentation result in significant changes in captured precipitation. Measurement techniques were changed in the USSR in the 1950s-1960s and homogeneity of precipitation time-series was disturbed especially in the northern regions. The history of precipitation measurement and methods of record homogenization in the FSU are given by Groisman et al. (1991). Producing adequate spatially averaged time-series is even more difficult because of the meso- or even microscale nature of precipitation variability, although in the western part of Northern Eurasia this disadvantage is partly compensated for by a large number of stations. Variability in precipitation during the period of meteorological observations is discussed by Vinnikov et al. (1990). 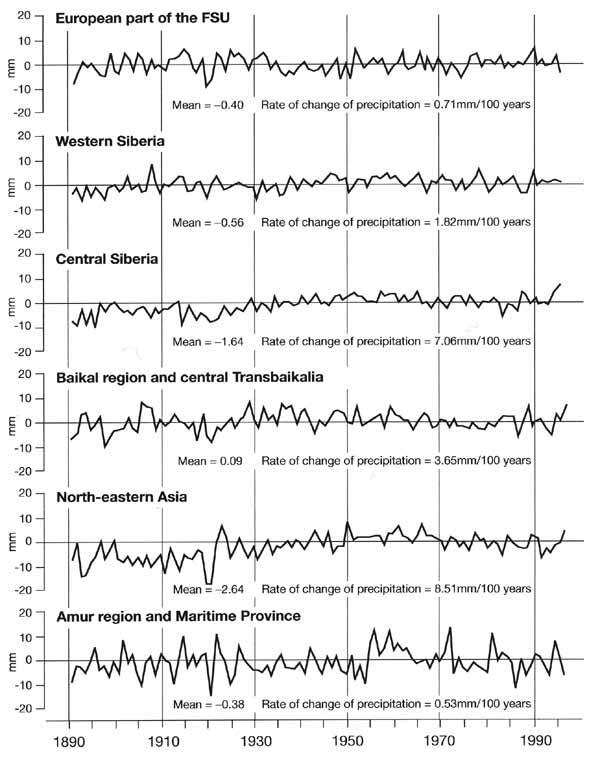 The time-series, adjusted to changes in instrumentation, reveal an overall increase in annual precipitation of 10 per cent between the end of the 19th and the 20th centuries. However, there are important differences between regions and seasons (Figure 3.18). Fig. 3.18 Annual precipitation anomalies for regions of the FSU expressed as deviation from the 1961-90 norm. Since winter precipitation is controlled by frontal activity, there is generally quite a good correlation between temperature and precipitation in winter and in most regions a recent increase in winter precipitation has been observed. Trends in summer precipitation and its relation to temperature (a factor crucial for agriculture) are more difficult to detect. There is no close correlation between summer temperature and rainfall and warmer summers are not necessarily the drier ones. Thus, in central European Russia, the currently observed summer warming has been accompanied by an increase in summer precipitation (Klimenko, 19946). Analysis of historical data, both written and instrumental, has shown that while in the Ukraine 25 per cent of extremely hot summers are also extremely dry, in central European Russia the probability of such coincidence declines to just 3 per cent (Lyakhov, 1995b). In order to evaluate whether changes in summer precipitation are damaging or beneficial for agriculture, historical records of evaporation are required because it is effective precipitation (defined as the difference between precipitation and evaporation) that controls moisture availability. Although measurements of evaporation began in the 19th century, homogeneous time-series only date back to the 1950s. Since 1951, evaporation has declined in the central East European plain and Siberia in step with the decreasing diurnal temperature range. No appreciable change has been observed in Central Asia and Kazakhstan (Nicholls et al, 1995). These trends are reflected in soil moisture variability. An analysis of observations of soil moisture content during the period between 1972 and 1985 has not confirmed the alarming trend of summer desiccation simulated in modelling studies and attributed to rising temperature. The increase in precipitation is thought to maintain the balance (Vinnikov and Yeserkepova, 1991). However, summer precipitation has not always been reliable during the period of instrumental records. The southern regions of the European territory and Western Siberia, which are the main agricultural areas, suffered from frequent spring and summer droughts during the last 150 years. Summer droughts were particularly widespread in the Ukraine between 1880 and 1910, when over 3 5 per cent of the Ukrainian territory experienced droughts, and during the 1930s and 1960s-1970s (Buchinsky, 1976).